"I want to tell the world about my pain. I think my son’s death was a premeditated murder. My son was tortured throughout his incarceration. His plight has brought me great pain and has been excruciating for the entire family. Even, as he was transferred to this prison, he was first held in Camaguey without drinking water for 18 days. My son dies after an 86-day hunger strike. He is another Pedro Boitel for Cuba. [Pedro Luis Boitel died in 1972 during a hunger strike while serving a 10-year prison sentence in Cuba]. "In the midst of deep pain, I call on the world to demand the freedom of the other prisoners and brothers unfairly sentenced so that what happened to my boy, my second child, who leaves behind no physical legacy, no child or wife, does not happen again. Thank you!" Zapata esta muerto; Viva Zapata! The “Hot Corner” it’s called by people in Havana, a spot in Central Park devoted to heated discussions about baseball. Some consider it the only space for democratic discourse on the island that survives, as long as the ardent polemicists confine themselves to sports. It was the spot chosen by Orlando Zapata Tamayo, a member of the alternative Republican Movement (a small, pacifist dissident group founded in 2002), to complain about “how bad things are.” The same day, Dec. 6, 2002, two agents from the political police arrested him and a few hours later he was charged with contempt, public disorder, and disobedience. Zapata Tamayo was imprisoned for several months in the Guanajay maximum security prison on the outskirts of Havana, from where he was conditionally released on March 7, 2003. Not even his fellow dissidents can explain how, given his legal status, this humble, black bricklayer and plumber found the courage, in that same month, to join in a fast with Martha Beatriz Roque and four other activists to denounce the situation of Oscar Elías Biscet and other political prisoners. Zapata could have cited the possible revocation of his conditional parole as a reason not to participate. But he acted out of conviction, and the so-called Black Spring claimed a new victim. Zapata was tried on May 18, 2004, and sentenced to 3 years in prison. His long ordeal then began, a story I would love to have the luxury of recounting in detail, one that could be made into a action-packed film (subgenre: “imprisonment”) if it weren’t for the fact that Hollywood almost always prefers a happy ending. Let’s turn our attention, first, to the protagonist: he was born May 15, 1967 – the year officially dubbed “Year of Heroic Vietnam” – in the town of Banes in eastern Cuba where he is now buried. 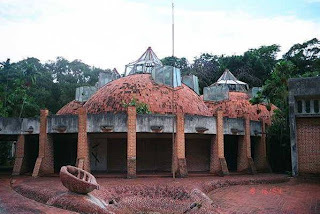 Banes was, incidentally, the birthplace of Fulgencio Batista and the house of the richest landowner in the region is now the municipal headquarters of the Communist Party. Reina, a woman of great will but scant education; Rogelio, an absent father; a stepfather who assumed the upbringing of a large family (Orlando was the second of five children)… these are just some facts regarding the environment surrounding a difficult childhood. Zapata Tamayo set himself up in Havana as a bricklayer, where he suffered the marginalization of the undocumented emigrant who leaves the eastern provinces and tries to survive in the capital. Perhaps all of this had something to do with his decision to join the opposition in a country where dissidents are automatically considered a social plague. There are few photographs of Zapata Tamayo: a black-and-white identity card photo; another group photo of the fast that led to his imprisonment, where he is not even looking at the camera. His ordeal in the Cuban penitentiary system is, however, well documented and worthy of review, because it serves as an illustration of the world of horrors barely talked about in the major media. So, let’s get back to our story. The three-year prison sentence Zapata Tamayo earned in the Black Spring seemed a small thing compared to the sentences of his comrades. But political passion and a vocation some have defined as “stoic” led to subsequent acts of prison protest, which increased his sentence to 36 years. He first served time in the Guanajay penitentiary. In April 2004, he quarreled with the prison director to demand that some magazines, seized in a search, be returned to him. The guards handcuffed him and beat him, causing multiple injuries to his face and teeth. Soon after, in front of his mother, the prison director, Col. Wilfredo Velázquez Domínguez from the Ministry of the Interior (MININT), again beat the prisoner, who was isolated in a punishment cell known as “The Tower.” On Jan. 15, 2005, Zapata was transferred to the Taco-Taco prison in Pinar del Rio province, where he undertook his first hunger strike. By that date, a French member of parliament, Thierry Mariani, who had been named “godfather” to the Cuban prisoner through international avenues of solidarity, had contacted French President Jacques Chirac, French Foreign Minister Michel Barnier, and René Mujica, the charge d'affaires at the Cuban Embassy in Paris, to express his concern for Zapata’s health. It was the first in a long series of public communications about the puzzling case. None of which had any effect. In 2005, Zapata began to “dig his feet in.” He was one of those prisoners who refuse to wear the clothes of the common convict and demand to be treated as a political prisoner. One more in the tradition of Mario Chanes de Armas, and so many others, who turned a moral gesture into a prison protest movement. This cost Zapata the second of seven trials he would be subjected to in his life. In none of them was he allowed to have his family present during the hearings, nor did he have the right to a real defense. A full description of the humiliations and horrors that this self-declared “re-education system” inflicted on this dissident’s life would be nearly interminable. But I do not want to spare the names of several miscreants, and this is a story full of miscreants. Every time Zapata was transferred between prisons, the authorities didn’t even take the trouble to tell his mother. She would learn about it on her arrival, after a difficult journey to the prison carrying bags of food for her son which were, on more than one occasion, confiscated, and which nearly cost her a complaint for “misappropriation.” Cookies, powdered milk, things like that… In July 2007 when she returned to Holguin after a visit in Camagüey, Reina was in a traffic accident. Two ribs punctured her lung and she needed emergency surgery. 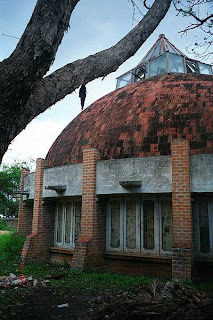 Already, in the Holguin prison, Zapata Tamayo had become the preferred victim of a species of human scum, a tropical version of the urkas of Stalin’s gulag: prisoner-assassins who, in exchange for visits, preferred housing, and reduced sentences, do the guards’ dirty work, dedicating themselves to beating and intimidating political prisoners. The most significant beating Zapata received occurred on March 21, 2008. Shortly afterward, July 26, 2008, two common criminals, one from Mayarí and another named Roberto Gonzales, alias “The Colt,” threw ten buckets of water in his cell and beat him with a broomstick. As payment for this outrage, “The Colt” earned himself a 72-hour conjugal visit. The last year of Zapata’s life was the worst. On Friday, May 15, 2009, accused of “disrespect and disorder in penitentiary establishments,” ten years was added to his already lengthened sentence. In Oct. 2009, several guards in the Holguin provincial prison gave him another beating, including a strong kick in the head. This blow caused an subdural hematoma, for which he had to be operated on. Locked in solitary, the authorities deprived him of water for 18 days, which led to renal failure. In mid-February, as he lay dying, after seventy days of hunger strike, he was transferred to the hospital of the Combinado Prison of East Havana, which, according to declarations by several former prisoners, did not have the conditions for adequate treatment. He was not invincible, in the manner of famous prisoners whose biographies the press enjoys sharing with us. Nor is his story that of the liberator who gets to see the realization of his ideals. But the man whom they are now burying in La Güira cemetery represents something superior on a moral scale, something very nearly approaching martyrdom. He was not an invictus, the kind of illustrious and invincible prisoner the press likes to talk about. He was unyielding. 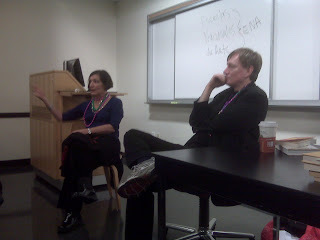 Today, my students and I (along with a class on Cuba taught by my colleague Katrin Hansing) had the great pleasure of playing host to a conversation about Havana, Cuban music, and modern dance between the renowned writer (and one-time modern dance teacher) Alma Guillermoprieto and the founder of Postmambo Studies, Ned Sublette. My students are currently reading Alma's book, Dancing with Cuba, as well as Ned's, Cuba and its Music. In a previous post I introduced Ned and his Postmamboist method of using music to understand history (and vice versa). You can read my own review of these two essential books (along with a few others on Cuban music) here. of intense listening (to music)." of dance, don't you think?" 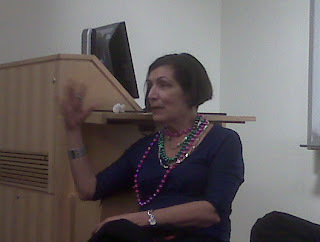 Yes, those are Mardi Gras beads around Alma's neck in honor of Carnival! Then, in this same spirit of witty and deeply felt exchange of ideas, Alma and Ned swaped stories of teaching modern dance in Havana in 1970 in a highly chaotic and politically charged atmosphere (Alma) and falling in love with Cuba while recording Timba and Rumba greats like "NG" La Banda, Los Van Van, and Los Muñequitos de Matanzas starting in 1990 (Ned). It was truly fascinating to hear them share their intense memories of their stays in Cuba during these two very different but equally heady times. Remember, 1970 was the grand climax and even grander failure of the 10-million-ton sugar harvest that wasn't. And of course, during the early 1990s Cuba was enduring the very worst of the "special period" economic crisis following the collapse of the Soviet Union. 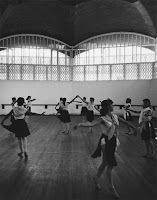 Escuela de Danza Moderna, Havana. 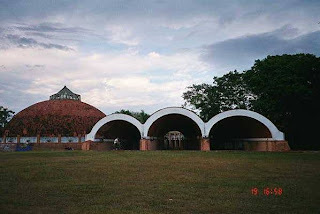 Architect: Ricardo Porro. Photo: Paolo Gasparini. Courtesy of John A. Loomis. It was also quite a joy to hear the sparks fly as two accomplished writers on Latin America and the Caribbean began to riff back and forth on one anothers' ideas, memories, turns-of-phrase, and powerful emotions. 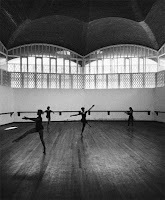 Alma was originally trained to be a modern dancer in late 1960s New York under the tutelage of Merce Cunningham, Martha Graham, and Twyla Tharp, and only became a writer, she explained, after she took five full years to "recover" from dancing with the encouragement of an uncle who owned a press service. She has written four books that I know of, publishes articles frequently in The New York Review of Books and The New Yorker, and is currently part of a team producing the new opera, Revolution of Forms, based partially on her own memoir and John Loomis' wonderful eponymous archetectural study of the rise and fall of Cuba's National Schools of Art. For a great set of photos of the amazing, half-ruined art schools see my color shots above and below or go here for others I did not take. Gary Marx also wrote a nice piece in the Chicago Tribune on rediscovering them back in 2004. Ned first trained to be a classical Spanish guitarist with Héctor García in New Mexico and Emilio Pujol in Spain before turning to Country and Western bar room music briefly, and finally to his life's love, Salsa, in 1980's New York. Exactly 20 years ago last month he made his first trip to Cuba (one of like 25 I think). It seemed to make as deep and lasting an impression on him as Alma's visit had on her 20 years earlier. Their combined musical, journalistic, and artistic production since then has surely been extraordinary! 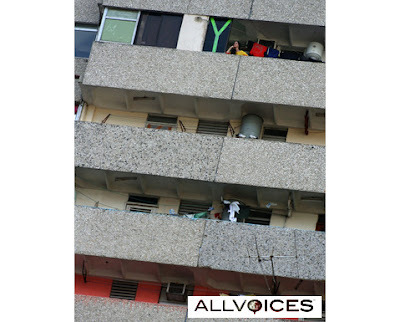 Two weeks ago on January 28, Cuban blogger, writer, and photographer Orlando Luis Pardo Lazo (pictured above in the blue Mexican shirt) published an extensive interview with Yoani Sanchez at All Voices. (By the way Penultimos Dias features an interesting debate on the interview in the comments section from its readers). 1) "Power in Cuba does not talk to citizens ... decisions are made in a single office, in a closed family and military clan. ... [but I'm looking forward] to a new stage where our leaders do not 'direct' us, but rather they 'serve' us." 2) "I support an immediate opening to allow all Americans to travel to Cuba, the end of the 'blockade' ... and in particular the complete elimination of anything that limits contact between the citizens of both countries." 3) "Obama and the country he represents can play a very important role in this opening of Cuba to democracy, but they must do so without interference with respect to our sovereignty and our decisions." While most of these statements are not new for Yonai, I don't think I have ever heard her use the word "sovereignty" before and her rejection of the embargo/bloqueo is becoming just as categorical as her strident and always incisive criticisms of her own government. Can you find La Flaca and La "i griega"? which is much more friendly." If you like to keep up on the evolving developments in U.S.-Cuban relations and especially in U.S. policy toward Cuba, I recommend that you sign up for the weekly news blast from Cuba Central. Every Friday afternoon like clockwork, the left-leaning (but wide-eyed) Center for Democracy in the Americas sends out a comprehensive round-up of the week's Cuba-related news from its Cuba Central project. More than anything else, Cuba Central is aimed at removing the travel ban on Americans going to Cuba and eventually ditching the entire anachronistic embargo. While I agree with their politics (most of the time), I recommend the news blast more for its sharp analysis, digestable size, clock-like effeciency, and plethora of links to important Cuba-related news stories from the previous week that I might have otherwise missed. To subscribe, click here and type your e-mail in the sign up space at the bottom leftside of the page. Tell me what you "KNOL"
Share what you know and write a knol. A "knol" is defined on the site as "a unit of knowledge," and from what I can gather after browsing some of the many available knols on the site (there's one on Amsterdam, another on the Roman Army, and even one that shares the low down on the universal, all-important riddle: How to Ask for a Girl's Phone Number), they seem like a cross between personal wikis and a meet-up group for people with very specialized intellectual pursuits or who share similar incurable obsessions! In short, a perfect place for nerds like me and Del Pino to share our interest and swap info on the Cuban blogosphere. Del Pino has set up a knol about Yoani Sánchez and you should really check it out. Paraphrasing her own words, the knol describes Sánchez as "Una bloguera cubana contra la utopía impuesta" (a Cuban blogger against the imposed utopia). I have found it to be a great resource on all things relating to La Flaca. It includes a biographical section, FAQs, details about Generación Y, a chronology on Sanchez's run-ins with the Cuban government, info on her promotion of the Cuban blogosphere, an inventory of press coverage of her, and a selection of her best posts, among other things. More than a month ago, I began a series of blog posts on the trials and tribulations of running a Cuban paladar (though I've never tried to do it myself). My first post reported that La Guarida, the famed paladar featured as Diego's "Hideout" in the Cuban film Fresa y Chocolate, had finally called it quits - after being threatened with heavy fines for alleged violations. My second post was the text of an extended interview I conducted years ago with Enrique Núñez, founder and owner of La Guarida. Those who read Spanish can also take a look at the more academic paper, "El sabor amargo del capitalismo: La experiencia incierta del paladar cubano, 1993-2006" (The Bitter Taste of Capitalism: The Uncertain Expereince of the Cuban Paladar), that I co-wrote with the Italian anthropologist Elena Sacchetti. (It is available at DesdeCuba.com's on-line magazine Contodos). Here in this third post, "Of Hideouts and Blue Ferrets...." [thanx to the reader who corrected my mistranslation of hurón - it means "ferret" not "heron" or "huron"] in the series, "Requiem for La Guarida," you will find my observations from a series of visits to the now closed paladar Huron Azul (Blue Ferret), along with the text of an interview I conducted in 2001 with Jose Carlos Fernández García the (former) owner of the paladar. Jose Carlos is pictured above in a police "mug shot" taken with him standing in front of his business (courtesy of Havana's finest). Fran, the restaurant's proud and quite friendly maître d’, who always greeted me with a story and a smile is pictured to the left. Huron Azul was long another of Havana's famed and supposedly "untouchable" paladares. It was reknown for its artist and intellectual clientele and its extensive art and wine collection (both clearly visible when dining in the restaurant). Legend has it that Jose Carlos acquired much of his art collection from artists themselves who used their work as "in kind" to pay their often heavy bar and restaurant tabs. While already well-known to foreign visitors to Cuba, Huron Azul became even more notorious (or perhaps it is the government that is notorious) when Yoani Sanchez featured a "found" police powerpoint of it on her own blog (see here for the Spanish version and here for the English one). I also include the English verion of the slideshow below for the benefit of readers of El Yuma. The length of the slideshow, the official-ese language used in it, and the detailed whodunnit dossier of photos it features all really take your breath away! Take a look for yourself - sin comentario.